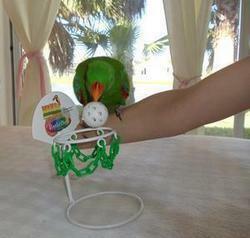 Great toys for teaching your birds tricks! Allow your bird to explore, play and swing on the chain or on their boing without worrying about your ceiling! Hang from your ceiling, affix your boing and allow them to climb, hang and swing! Birds can't bypass the disc. 6" round acrylic disc with 1 1/2" plastic chain. Colors may vary. Recommended for x-small to small birds, from lovebirds to conures, caiques and similarly sized birds. Allow your bird to explore, play and swing on the chain or on their boing without worrying about your ceiling! Hang from your ceiling, affix your boing and allow them to climb, hang and swing! Birds can't bypass the disc. 11 3/4" round acrylic disc with 1 1/2" plastic chain. Colors may vary. Recommended for medium to large birds. The Olympic Committee might just want to put this one in the games! For the bird that is determined and skillfull to get the ring past the peg. Great for training on any of the Mango Basketball sets! This is a great easy to use training guide! The intent is to build and maintain a strong, life long relationship with pet birds. As a playoff coach, you'll teach your bird that it ain't the win or lose, it's how you've played the game. Each playoff will be the rebound that your family has waited for. Loads of court side laughs for you and exercise and fun for your bird. Comes with slotted ball for easy pickup. Recommended for small birds, such as conures, caiques, pionus and similarly sized birds.